We’ve all had those moments where at any second what is bad could turn worse. This is how we enter this scripture. Kathryn M. Schifferdecker, Associate Professor of Old Testament at Luther Seminary in St. Paul, Minnesota, speaks into a bad-could-easily-turn-worse text in Jeremiah. In a post on workingpreacher.org, Schifferdecker says, “Any reasonable person can see that [Israel] is doomed. Jeremiah’s many prophecies of judgment—prophecies that have landed him in prison—are coming true. Yet now, in the midst of catastrophe, the prophet finally speaks words of promise! As we consider the start of Advent tomorrow, December 2nd, let’s look more closely at Jeremiah, and the scripture that begins the season before Christmas. You’ve heard about impending doom. You have that friend, acquaintance or have passed a street corner preacher who, by their calculations, predicts the Second Coming of Christ will be here before President’s Day Weekend, 2019. The possible impeachment of a president, the earthquake in Alaska, and the adamant argument that some say we are—and some say that we are not—experiencing global warming are just three examples I found as headlines today, December 1, 2018. Let’s not be dismissive of the New Testament’s unarguable promise that Christ will come again and will judge the living and the dead (2 Timothy 4:1 and 1 Peter 4:5). Let’s also be mindful that humankind has done atrocious acts throughout our collective history and that we might make it to Labor Day, 2020. Let’s get back to Advent, 2018. This scripture from Jeremiah speaks indirectly to what we can do directly, which is bring hope into the world. Jeremiah bought property to show his faith in God. What will you do to show your hope in God? My congregation joined the community last Sunday night for one bold move of hope and faith in our “Light Against Darkness: Hope For All” Christmas tree lighting. As different community leaders decorated the tree with different colored bows that represented their organization, we let the neighborhood know that when we join in song, Spirit, and a commitment to a better tomorrow that begins today, we, like Jeremiah, do bring hope for all. PRAYER: Heavenly Father who sent Your Son to us, we pray for all governments and national leaders today. We pray for those affected by the earthquake in Alaska. We also pray for our global environment which really begins with the conscious care of our own front yards. And, speaking of front yards, help us all see that this uniquely decorated tree on our church’s front lawn says that we, like Jeremiah, have hope—and will share hope—during troubling times. Amen. 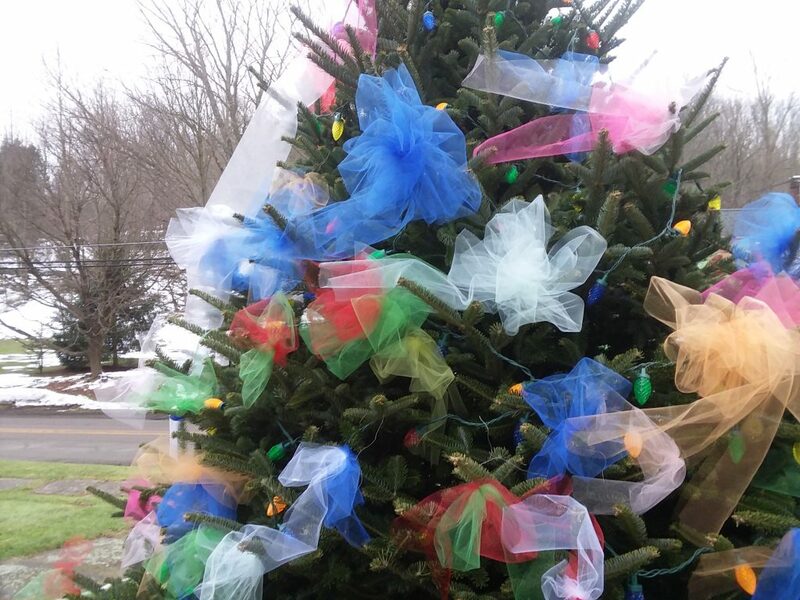 PICTURED: these bows symbolize some of the 17 groups that gathered and decorated the tree on November 25, 2018, the night of the Community Tree Lighting.